Two minor incidents, when I was 15 and 23, have left me with two back injuries which have dogged most of my adult life. The first incident was so minor I more or less forgot about it, with typical teenage insouciance; the second incident was less so, requiring painkillers for a few days and a board under my mattress. Even so, I never imagined that the two injuries and their after-effects would return with a regularity and randomness which cannot be predicted or avoided. Yes, I'm one of those people whose back can "go" while I'm drawing a curtain, getting up from a chair or doing any number of innocuous daily tasks which cannot be avoided in the way that I can avoid lifting heavy boxes or moving wardrobes. Yesterday, I stooped whilst looking for something and felt a sudden wave of pain which eventually coalesced in my lower back and right hip. It's not excruciating and I have painkillers to hand, so I could stun the pain into ache-y submission and enjoy strolling around St Giles Fair with my community, and was able to sleep all night. But the pain is still here; I know from experience it will take another day or so to clear, and so this morning I faced the day with weary resignation. I started thinking of reasons to be grateful for my backache, reminding myself it could be a lot worse, rather like Pollyanna playing her "glad game", but then stopped. No: don't be grateful "because"; just be grateful. 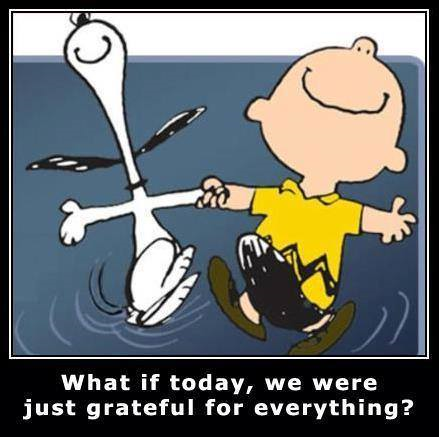 Just express gratitude to God; just live today in an attitude of gratitude for everything without justifying, relativising or making up reasons for it. It's harder (rationalising is so much easier!) but also richer, and somehow leaves me feeling more contented, maybe because it's more real; maybe, too, because such an attitude can only be lived from and with my heart. PS: It seems as though gratitude was destined to be today's theme, because later on, my Facebook feed also led me to this blog. Yes, she's giving reasons for her gratitude, but what she writes is brilliant, inspiring and salutary, all rolled into one, so do read it!